In this breakthrough introductory text, educators Jamie Pope and Steve Nizielski, and science writer, Alison McCook use real stories—about real people and real science—to teach the basic concepts of nutrition. Each chapter reads like Scientific American-style article, with compelling reporting and beautifully designed infographics providing a context for the scientific content. 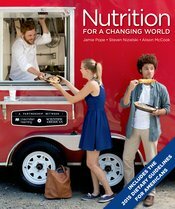 Unique chapters on timely topics (diabetes, cardiovascular disease, plant-based diets, fat- and water-soluble vitamins, dietary supplements, and the college years) exemplify the book’s thoroughly contemporary approach to nutrition science. Nutrition for Changing World is also the only product for the course to offer personalized, auto-graded diet analysis activities. These AnalyzeMyDiet activities and the diet tracker are included in LaunchPad, a dedicated online course space that compliments the text to provide students with a fully integrated print/digital learning experience.